We hope you enjoyed our first post on making pesto. If you have some left, or liked it so much that you would like to make it again to try on another recipe, here is the chance! We are using it for making stuffed tomatoes. These may serve well as side dishes or starters. 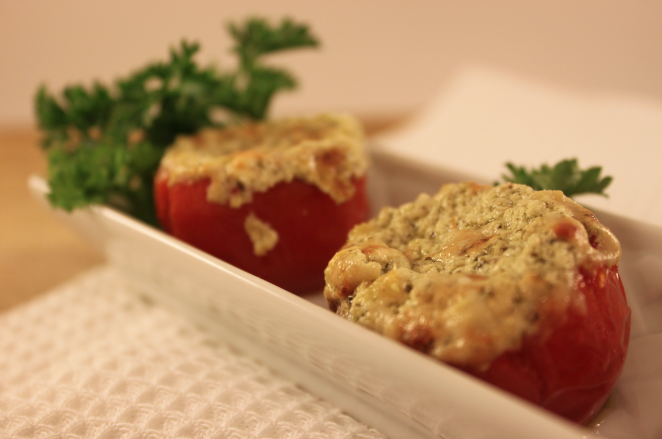 Preheat oven to 180 degrees C. Slice tomatoes in half horizontally and scoop out pulp and seeds. Meanwhile, in a medium bowl, mix together cream cheese, garlic, 3/4 of the mozzarella, basil, pesto and seasoning. Stuff tomatoes with the filling, sprinkle with remaining mozzarella. Use the olive oil to lightly grease the baking tray, place the tomatoes and bake until they are cooked through and tops are golden brown, about 10 minutes. Source: Slightly adapted from Pudding Pie. Categories: Recipes, Tomatoes | Tags: pesto, side dish, starter | Permalink.